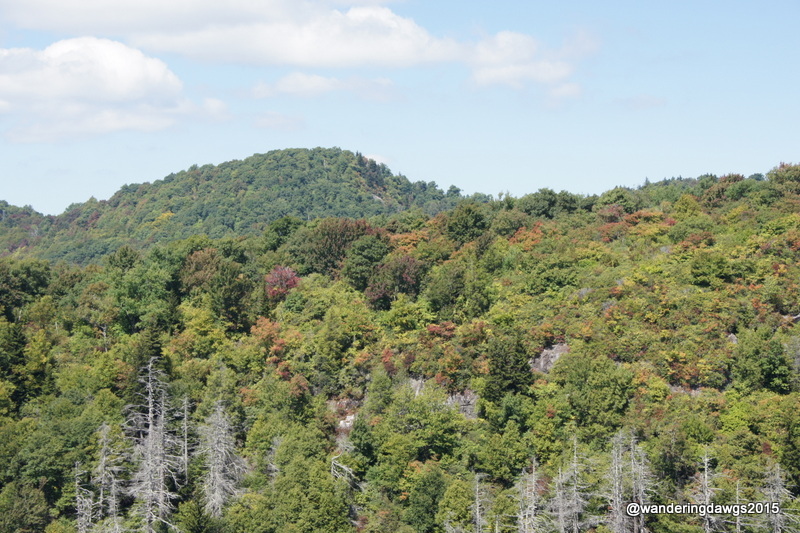 After two days of elk watching in Cataloochee Valley we packed a lunch and set out from our campground in Waynesville for a 40 mile drive on the Blue Ridge Parkway in search of fall colors. The Blue Ridge Parkway is a 469 mile scenic parkway through the southern Appalachian Mountains in Virginia and North Carolina. 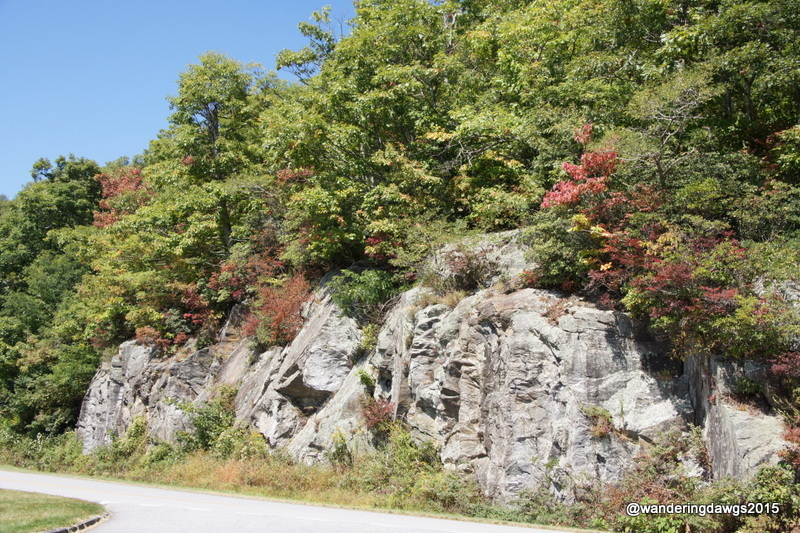 The northernmost point of the parkway is Mile 0 in Rockfish Gap near Waynesboro, Virginia. The southernmost point is Mile 469 near Cherokee, North Carolina. There are scenic overlooks, picnic areas, hiking trails, and campgrounds all along the way. 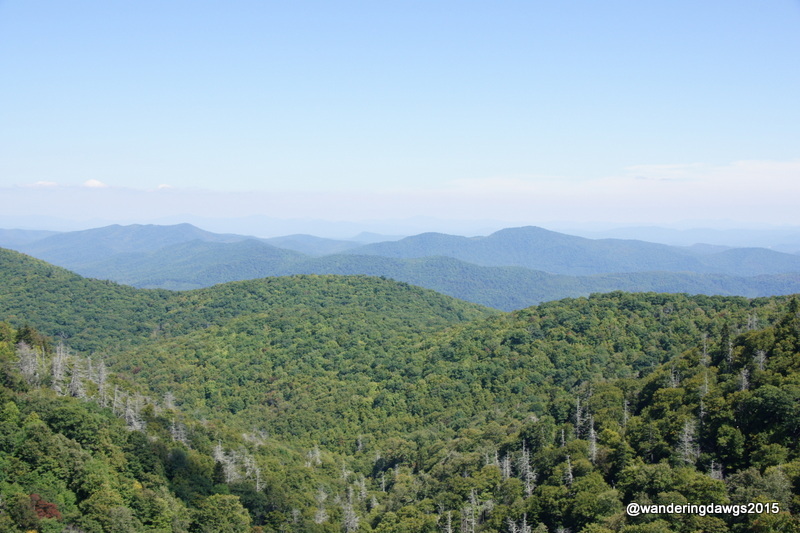 Although we have traversed several sections of the Blue Ridge Parkway in the past we had never been on the area in North Carolina north of the Highest Point at Mile 431. On our journey this time we traveled south from Mile 408 at Mount Pisgah to Maggie Valley at about Mile 455. The first order of business was a picnic at the Mount Pisgah picnic area at the top of a short paved trail. After lunch under the trees we started our journey south, stopping at several of the scenic overlooks. 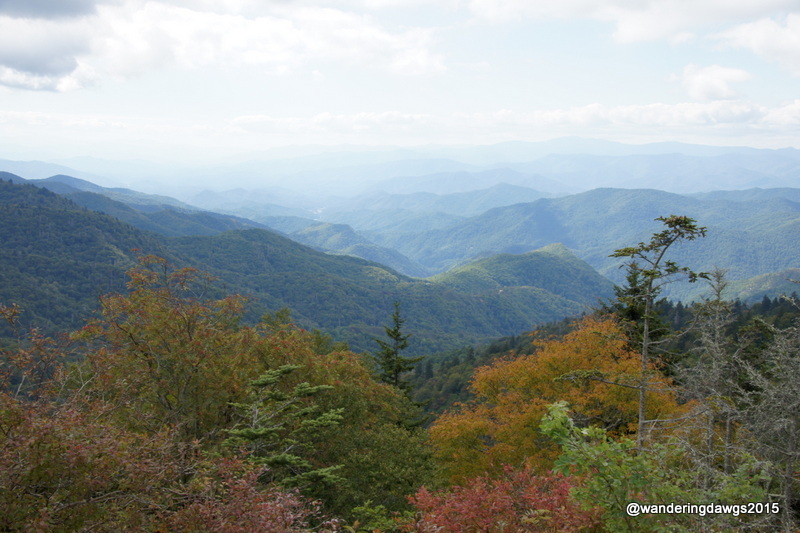 It was too early in the year for the peak autumn colors but a few of the leaves were beginning to change. 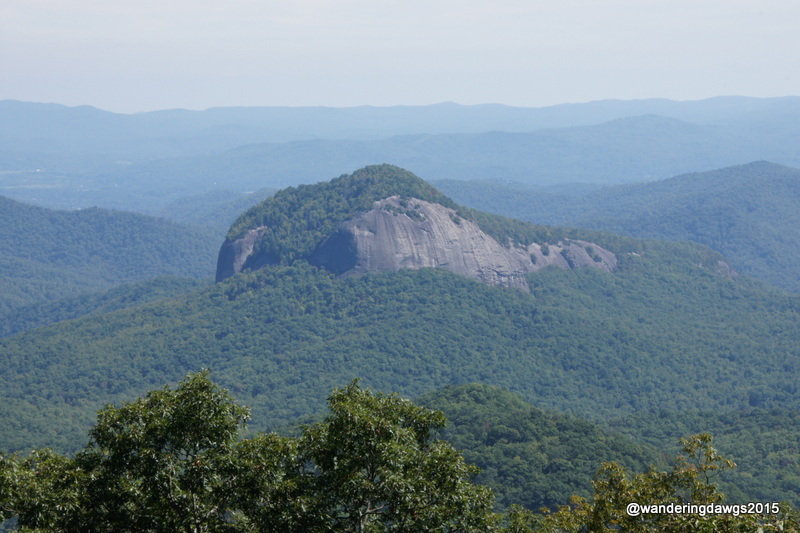 Looking Glass Rock got it’s name because sunlight will reflect off the granite when there is water collected on it. There was beautiful scenery every where we looked. We found a few more fall colors. 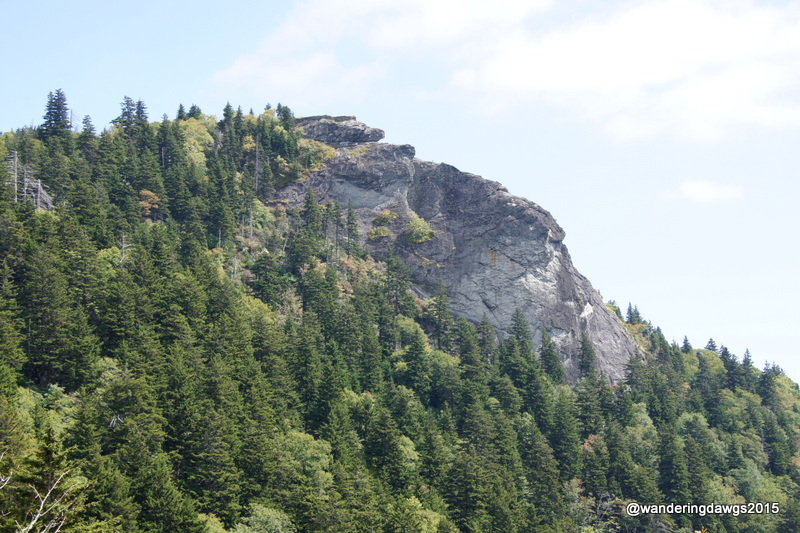 There are many folktales surrounding the Devil’s Courthouse. It was getting late and we decided to skip the trail to the top. The picture on the left was taken 8 years ago when we first stopped at the Highest Point of the Blue Ridge Parkway at Mile 431. The one on the right from this visit. The photo below is the view from the Highest Point. 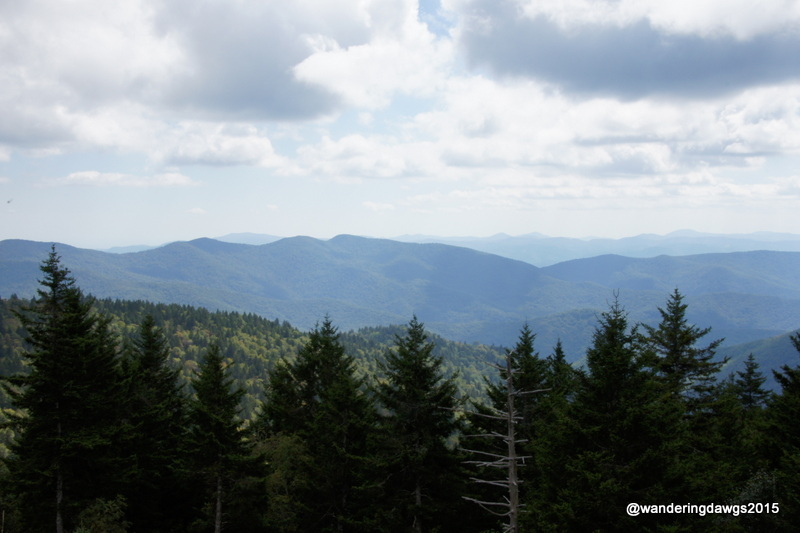 Our home base for exploring Cataloochee Valley and the Blue Ridge Parkway was Creekwood RV Park a few miles north of Waynesville and Maggie Valley. Our site backed up to a beautiful creek. It was a perfect place to relax after a day of wandering. Of course we had to try some North Carolina barbeque while were were there. 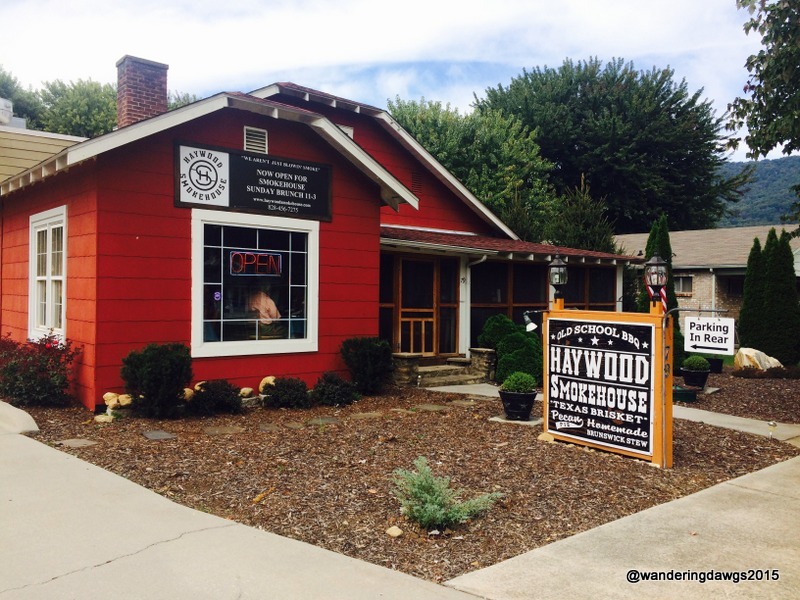 The Heywood Smokehouse in Waynesville was recommended and the spareribs, chicken, and brisket were done to perfection. And it turns out the owners are originally from Georgia! Beautiful fall weather, bugling elk, scenic drives, camping beside a creek, and delicious barbeque. It doesn’t get much better than that. Lake of the Ozarks State Park is the largest state park in Missouri. The park has many miles of shoreline as well as many trails for hiking, biking or horseback riding. The rain followed us from Columbia and our hopes of hiking were rained out. We chose not to pull our fifth wheel on the narrow, winding roads to one of the beautiful waterfront sites in the campground. Instead, we stayed in a big site with a view of the woods. We enjoyed watching four deer come out at dusk. Rock cliffs line the shoreline at Lake of the Ozarks and although we were too early for the fall colors to be at their peak the trees were starting to display the beautiful orange and yellow of autumn.